My BIL gifted his wife with a Wilton Cookie Tree Cutter Kit which comes not just with cutters/shapers but also recipes for the cookie dough and icing. Can't find a Wilton Kit? 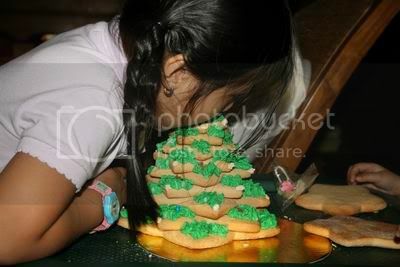 You can just purchase your own different-sized cutters from any baking supplies store, use your favorite cookie recipe (because the recipe provided by Wilton's gave a new meaning to TOUGH COOKIE, eventhough it tasted good) and decorate your own way. You can even use different-sized bottle covers as cutters. You also have the option to attempt to carve your own leaf designs around each circle of dough. 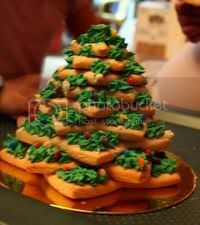 And yes, you can even use gelatin (just make it really firm) for the tree. For the icing, any recipe will do. Just use food coloring. No piping bags? Be creative with sandwich bags! And any itty bitty candy will do for decoration (my SIL used Nips, a local version of M & Ms). 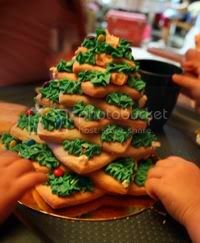 This would make a really lovely Christmas centerpiece... and your kids will have fun decorating it.